Asus has crafted the definitive hybrid. A stunning screen, Tegra 3 power and excellent keyboard are all reasons to buy. The Transformer range of Android tablets has become the jewel of Asus's crown and the best alternative to Apple's new iPad. Along with the Asus Transformer Prime and the Asus Transformer Pad 300, the most recent tablet – the Asus Transformer Pad Infinity – keeps the excellent keyboard docking station that made the range famous and adds (among other things) a much improved high resolution screen. 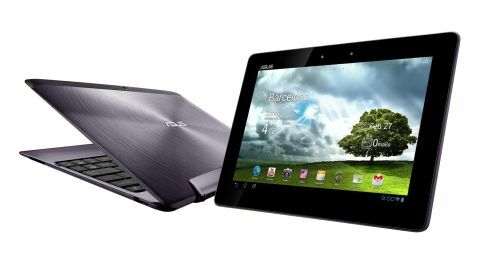 Outwardly, the Asus Transformer Pad Infinity is almost identical to its predecessor, the Transformer Prime. The tablet - highly priced at £600 in the UK and $600 in the US for the 64GB version - has the same brushed metal and concentric circle design. The chassis is crafted from aluminium and you'll find a 10.1-inch Gorilla Glass display staring up at you when you lift the tablet out of the box. There are subtle differences, however. The Transformer Pad Infinity is a hair thicker, with 0.2mm of added girth, although weight-wise it stays at the same 635g as the Prime – lighter than the new iPad. The real difference lies in the beefed up resolution of the screen. As with Apple's new iPad, Asus has taken its original model and crammed more pixels onto the display. You're given a 1920 x 1200 resolution in place of the Prime's 1280 x 800, although the brightness has been kept at 600nits. Elsewhere, the similarities continue. The Asus Transformer Pad Infinity runs Android 4.0 Ice Cream Sandwich. We haven't heard yet whether an Android 4.1 Jelly Bean update is inbound, although it's sensible to assume we will see one before the year is out. Power is provided courtesy of the Nvidia Tegra 3 quad-core CPU - which has become de rigueur for top-tier Android tablets. Special mention goes to the Infinity Pad's gaming prowess, since the fantastic screen and beefy processor will combine to run any game you'd care to download from the Google Play store. Any Android fan should undoubtedly have this at the top of their next-purchase list, but for those who still aren't too certain, there's plenty here that sets this aside from the glut of other tablets on the shelves. Read on to find exactly what makes this so special.